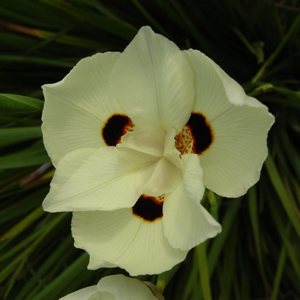 Dietes (Moraea) bicolor is a clumping perennial with sword like leaves and is a native to South Africa. Bicolor Iris naturally occurs near streams and wet areas in the Bathurst district of the Eastern Cape. Even though it is native to wet areas, it is drought tolerant as well. To keep clumps looking neat only cut back old damaged foliage and large seed heads for best results. Flowers are iris type, 2″ in diameter, yellow with maroon blotches fading to brown. Bicolor Iris can reach up to 2 feet tall at maturity and works great as an upright effect in the landscape.